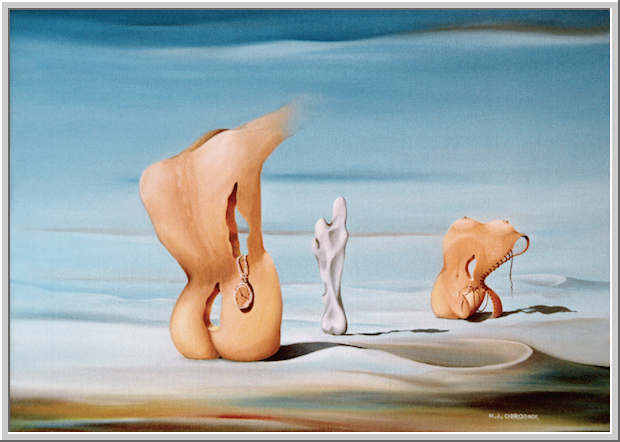 Selective collection of surrealistic paintings and photography. "...Martin Jan Ogrodnik’s pictures do not have anything to do with decor. They are as far as possible away from the charm of the superficial. Even though painted by a master of the hand, with great care and enormously accurate motions these are not decorations. Instead it is, all the time, the creation of man’s eternal drama. As a playwriter he sketches sceneries with enormously explosive power. The idyll never gets any space worth mentioning. The great emotions and the big games and the important decisions are at display...". ©1998-2019 MB Design. All rights reserved.